Do you know Miyajima? Miyajima is one of the top three most scenic spots in Japan, where Itsukushima Shrine, a World Heritage Site, is located. It takes about one hour from the Hiroshima Station by train. There are many wild deer in Miyajima, especially in the Omoto-Park. They are very friendly to us and so cute. But sometimes, they try to take your foods or the like away. Please be careful. 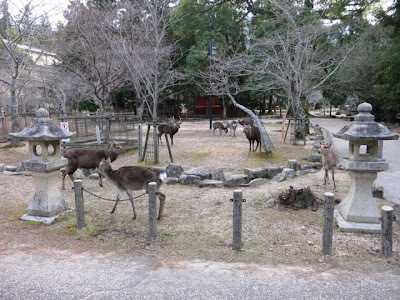 In recent years, feeding deer is prohibited in Miyajima, so they may be hungry, I think. It's very difficult to keep nature and wildlife as they are.